Family dies, we get our hearts broken, lose jobs. Pain searches for us. 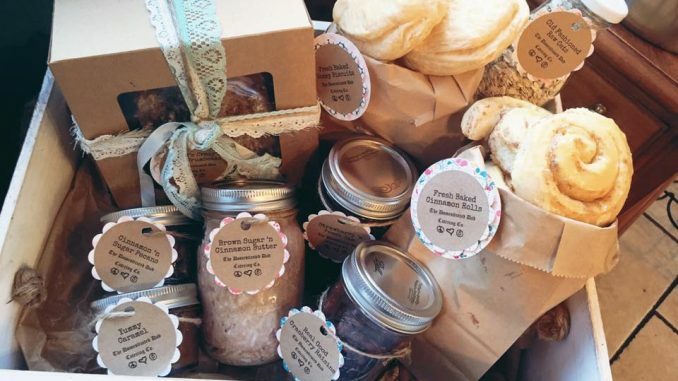 These 5 sympathy gift baskets are the best thing you can send someone in pain. Tragedy strikes suddenly and powerfully. It affects us deeply. If a loved one is going through a tough time, we feel helpless. How can we help them? Can we make them feel better? 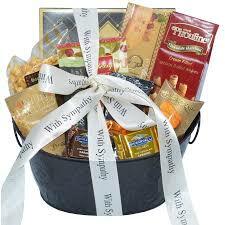 Sending a sympathy gift basket is a good way to help lift their spirits. 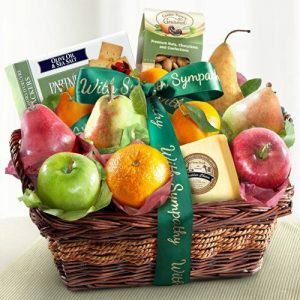 In this article, we review the five best sympathy gift baskets in the market. If you know someone who is in pain after the passing on of a loved one and you are wondering what is the best way to pass on your deepest condolences to them, this Great Arrivals sympathy basket will do. The idea behind this basket is that it contains treats and snacks that are not easy to find in any grocery store. 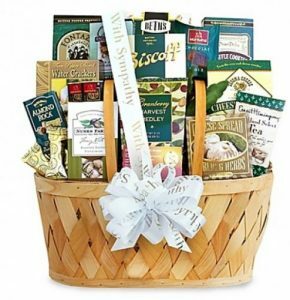 It’s an elegant, upscale gift basket packed with gourmet foods. The mourning family will be touched that you went to all this trouble. The gourmet nature of the foods implies the high value you place on your relationship with them and the depth of your sympathy. It contains foods such as gourmet cheeses, smoked salmon, crackers, nuts, cookies, coffee, Claire de lune brie creamy cheese spread, and a delicious assortment of premier chocolates from Lindt, Ghirardelli, Godiva, and Harry & David. The touching package arrives elegantly arranged in an oval dark-stained sympathy gift basket. The basket has a hand-tied ribbon crossing it diagonally. Written on the ribbon are the words: “with sympathy”. The problem with this package is that it does not contain as much food as you would think. It’s a collection of small helpings of different snacks. Filled with comfort food, the gift basket is more eloquent than an awkward “I am sorry”. At such times, actions speak louder than words. It contains gourmet caramel corn, Aunt Gloria’s sugar cookies, Nikki’s butter toffee peanuts, gourmet camembert cheese, jelly bellies, water crackers, cheddar popcorn, 2 bellagio hot cocoas, and other snacks. They are comfort foods because these are what we turn to when we find ourselves under severe emotional strain. They are foods that are filled with nostalgia and a sense of security because they perform the magic of taking us back in time, usually to when we were children. This basket of comfort food will certainly comfort the bereaved. The basket itself is attractive and made of metal. You have the option of including a card with your personal message. When tragedy strikes, naturally, the affected do not want to ever be cheered up. They may want to wallow. Still, it’s our duty to try and make them feel better without coercing them to “cheer up” or anything as ham-fisted as that. One way to improve someone’s mood is with good, healthy food. It lifts the spirits, particularly fruits. In fact, research has shown that fruits have the ability to substantially increase your happiness levels. That is why this Golden State fruit gift basket is a worthy choice. It contains 1 navel orange, 3 mandarins, two varieties of apples (Braeburn and Granny Smith), two varieties of pears (Bosc and red), and a fruit in season. 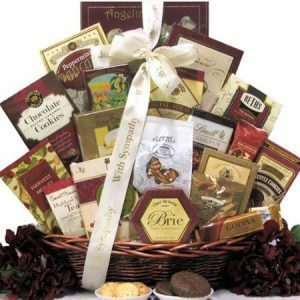 The gift basket does not only contain fruits, however, it also contains natural cheddar cheese and roasted, salted almonds. During warm weather, the basket will have 7-ounce Jar artichoke cheese dip instead of cheddar cheese. There is nothing as charming as a proper woven basket and that’s what you get with this gift basket. The woven basket has a ribbon tied around its contents. The ribbon has the words: “With Sympathy”. You can add a message to go with the gift. Are you at a loss what to send to your Jewish friend who has lost a close member of their family? Given the strict traditions of Judaism, it can be difficult to figure out what sort of gift basket to send to a Jewish friend during their period of sitting in Shiva. Fortunately, you do not have to worry too much about the details. This Broadway Basketeers sympathy basket is Kosher-certified, which means that the foods it contains and the ingredients used to make them are approved under the laws of Judaism. However, it is not only your Jewish friends who will find this basket touching, but everyone else too. It contains snacks such as yoghurt smothered pretzels, cappuccino chocolate chip cookies, deluxe cherry & nut mix, and gourmet triple play popcorn. These snacks are all tasty and delicious. Even their names sound appetizing They may not enough to comfort a heart that is wounded by grief, but when eating these, your bereaved friends will, for a brief moment, get some comfort. The sense of taste is very powerful and when given a delicious stimulation can sometimes transport someone briefly away from their heartache. However, the package may be smaller than expected. When their thoughts are consumed with the grief of their loved one, no gift can touch the hearts of bereaved people as a gift basket filled with snacks can. A bouquet of flowers doesn’t come close. The sense of taste can be a powerful trigger. This basket contains snacks like chocolate chip cookies which can trigger memories of happier times, for instance when one was a child. The brief episodes of nostalgia are good for the heart. Other tasty eats contained in the gift basket include crackers, dark chocolate, biscoff cookies, English toffee, Sonoma cheese straws, butter toffee pretzels, truffle cookies, cheese, almond Roca, nuts, and cranberry harvest medley. In times of stress or grief, people need symbols, because words become meaningless. Symbols become powerful metaphors, carriers of deep messages which can have a powerful impact on a grieving heart. The symbol that accompanies this gift basket is a guardian angel keepsake pin, something your friend can hold on to and know that you are thinking of them and standing by them during their trying period. Why Do We Crave Comfort Foods? When you are in emotional pain, for instance when someone you love is in trouble or passes away, or when your heart has been broken such as in a breakup, eating some types of food can make you feel better. These are foods that tend to have a high nostalgic or sentimental value, foods that transport you to a happier place. For a brief moment, you get some respite from your woes and you forget your troubles. This can mean a great deal for someone in pain, especially when the comfort food comes in form of a gift basket from someone who cares about them. The combination of comfort food and the knowledge that someone cares is powerful, and this is the true value of sympathy gift baskets. Other than their sentimental/nostalgic value, comfort foods also tend to have a high calorie content and a high carbohydrate level. The nostalgia or sentimental value may differ for individuals or for different cultures. A 2015 study shows that psychologically, people tend to associate comfort food with relationships. For instance, the more isolated a person is, the higher their desire for comfort food. One also experiences a craving for comfort food when their sense of belonging is threatened. This is when a sympathy gift basket comes in handy. You may not have the words that can heal their heart, but you can at least help them feel a sense of connection with somebody or something that they deeply treasure. Comfort food is very powerful. The very smell of it is enough to trigger power memories, emotions, and associations. The sympathy gift baskets we have reviewed here are mostly packed with tasty snacks. These snacks will remind the eater of back when they ate similar snacks: when you ate chocolate or cookies or toffee. More often than not, these are snacks which you ate in childhood or when you were very young. Maybe they will remind you of your parents or your siblings or even your dog. They might remind you of the house you lived in when you were a child, the school you went to, your teachers, your friends, your first sweetheart. Such memories and associations, even though you may not consciously remember them, are powerful enough to trigger feelings of happiness and security. According to psychological studies, when you consume foods that are energy-dense and have a high content of calories, fat, salt, or sugar (foods like chocolate, French fries, and ice cream), a reward system is triggered in your brain and you temporarily feel better. The dark side of comfort foods is that people can binge on unhealthy food in a bid to make themselves feel better. Unfortunately, the instant gratification that you get from comfort foods is short-lived. If you binge on them, trying to treat your pain, you might end up feeling hollower. Besides, overeating unhealthy foods can cause health problems like obesity. That could be why the sympathy gift baskets we have reviewed here contain snacks in small batches. Some of them are so small that customers complain, but looked at in this light, that smallness could be a benefit. When your friend is in emotional pain, such as after facing a death of a loved one, you can send them a gift basket packed with comfort foods and it might make them feel better. This is why Nikki’s Gift Basket emerges as the best on the list. 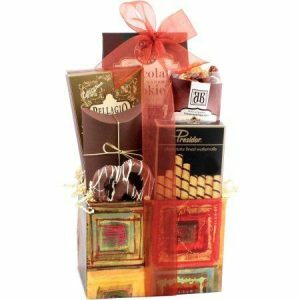 It faces stiff competition from Great Arrivals Sympathy Gift Basket which comprises of gourmet foods such as smoked salmon and gourmet cheeses. The comfort foods in Nikki’s Gift Basket are sure to transport the eater to a simpler time, giving them a feeling of nostalgia and security that may briefly lift their low spirits. The delicious treats are packed in a beautiful metal basket. Another good thing about it is fast delivery and the ability to add a personalized message to your package. Of these five gift baskets, which one attracts you most?